Join us for a tasting flight or a glass of our small production sparkling wines at our tasting room and garden in downtown Healdsburg. 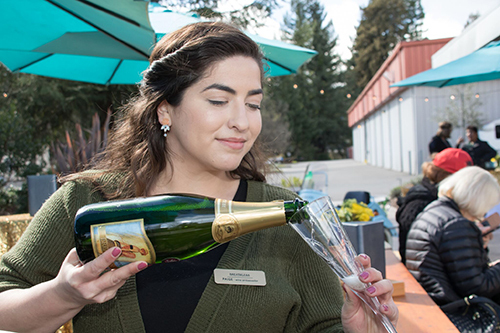 Celebrate everyday while you learn about the history and art of making sparkling wine in a fun, casual atmosphere. Enjoy a daily assortment of our sparkling wines as a flight. Compare the different styles while you learn about the sparkling winemaking process. After your tasting, feel free to enjoy a glass or a bottle on the patio. Club Members and up to 4-6 guests receive complimentary tastings. Purchase 4 or more bottles or join our Sparkling Society Wine Club and we'll waive the tasting fee! See firsthand how sparkling wine is produced in our state-of-the-art production facility. You'll be led through the facility and educted on the process step by step, culminating in a tasting of three award winning Breathless sparkling wines. Available Monday through Friday by reservation. Weekend tours subject to availability. With the Breathless sabrage experience, you’ll receive one-on-one instruction with a Breathless staff member teaching you how to properly open a bottle of wine using a saber. You’ll also receive the newly decapitated bottle of Breathless Brut Sparkling Wine to enjoy on the property. 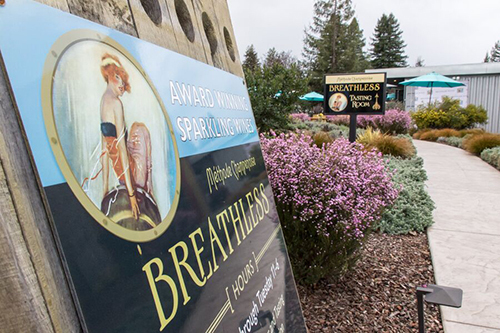 Breathless Wines welcomes groups of 6 or more with advance reservation. (Mon, Tues, Thurs, Fri, and Wednesdays by appointment) Saturdays and Sundays we offer 30% off our regular tasting fees and 30% off wine purchases. Industry parties of 6 or more will receive 30% off the tasting fee and 30% off wine purchases - daily. Reserve your tasting by emailing: reservations@breathlesswines.com or fill out the appointment form.